After helping the villagers evacuate their homes, the 3rd Recon team fought off the fire dragon with the help of one of their new acquaintances. After the battle, the various villagers dispersed to go to other settlements, but a small group was left in the care of Itami and his team. The anime has more Tuka, and simply by showing additional scenes of her mourning makes it more convincing than the manga. It really feels like she is mourning as the point is reinforced throughout the episode. This episode follows the manga pretty closely with only a few alterations to order of events, added scenes, and scenes that were cut. Overall, it was fairly laid-back and no major action took place, unlike the previous 3 episodes. In the midst of all of the construction of the base and of the accommodations for the refugees, this episode takes a little time to give some more depth to the three girls (Rory, Tuka, and Lelei) in a few added scenes to make up for the weakness of their introductions. (This is actually a scene from the first page of the next chapter, but since it happened in this episode and the next chapter includes way more than just this one scene apparently, I’ll put this here.) This scene about China’s “president” adds to the whole global politics aspect of GATE, an area that I hope gets more attention as the story progresses. No it isn’t. It’s Tuka Luna Marceau. In the first use of her name, the narrator pronounces it with a “ch” sound, but the rest of the times, it is a “t” sound (though less clearly a “t” than the clarity of the first use being a “ch”). I guess it’s better to be less-obviously wrong all the time than obviously wrong once? The flashback at the opening of this episode about what happened to Tuka’s village doesn’t include the scene where her father shoots the fire dragon in the eye with an enchanted arrow, which was the most important thing. That scene was why she knew to tell the JSDF to aim for the eyes last episode, and it makes no sense to have this shown after the dragon fight. Showing the result first and reason later only works for things that are suspenseful, not “well maybe it’s an elf thing to shoot stuff in the eyes?” things. Chapter 7 opens with a hilarious retelling of the battle with the fire dragon by a tavern waitress. The jokes are, of course, just as obviously phallic, but the funny part is that they think the Panzerfaust is magic and casts the spell “Backblast Clear” to make things go boom. This little nod to the comedic scene of performing a shoulder check in the last chapter gives the jokes a variety of levels (lowly phallus references and technological misunderstandings based on a detail from a previous event). This chapter recounts the events of the Battle of Alnus Hill, a topic covered earlier in the anime as it took place chronologically within the story. The story better fits where the manga places it, as it gives the interaction between Piña and Dulan, King of Elbe more depth and meaning. Instead of a “here’s what’s going on,” we get a “here’s what happened to make this king lose an arm, a leg, and his army,” which ties into Dulan’s realization that the enemy isn’t the JSDF, but the Empire and ties Piña’s visit together in a serious and meaningful way. Again, we see more into Lelei’s thoughts in the manga. We may not see her in a chemical ordnance suit, but we do learn more about why she would be in such attire - research and discovery. While easy to infer in the anime, it’s nice to see it explicitly stated in the manga, as it strengthens her character as the calm, inquisitive sage. Rory is indeed to scary. You never ask a lady how old she is, especially when she can chop you apart with her halberd as easily as she can bat her eyelashes. Little details like the fact that, using conservative numbers, by selling the scales alone, they would have enough money to last them 13,000 days (35.6 years), are good ways to give characters like Sage Kato (who looks more like Gandalf in the manga as opposed to looking more like Radagast in the anime) some more exposure and build the world some. I honestly could not think of any things that the manga did poorly. Believe me, I tried. This week’s anime episode was a nice change of pace as it tried to make up for poor introductions, but it just doesn’t live up to the manga’s character depth, and the decision to move some events around, like the Battle of Alnus Hill, are detrimental to the story line’s tone. There have been some odd decisions made in the adaptation so far, none of them atrocious, but a few that are pretty detrimental to the experience of the material overall. The story itself has progressed in an interesting direction with the introduction of global politics back in Japan. 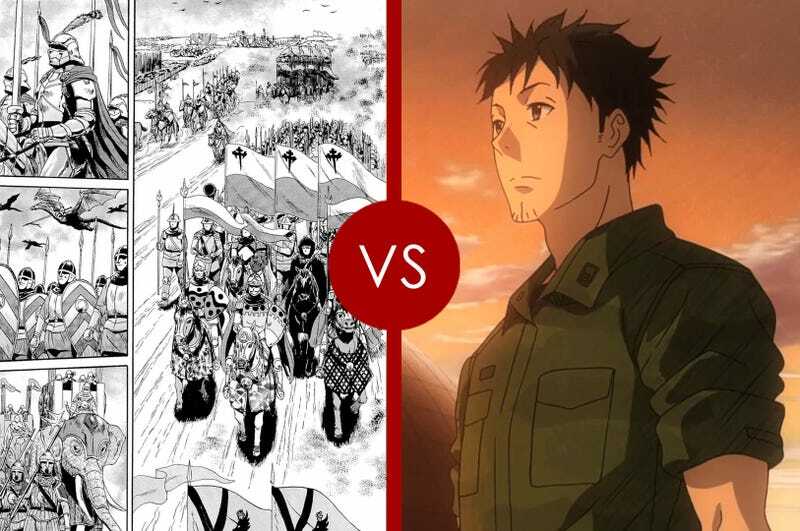 I hope they go further with the politics of higher-ups and officials with agendas commanding soldiers like Itami who are just trying to do the right thing for the people they can help.